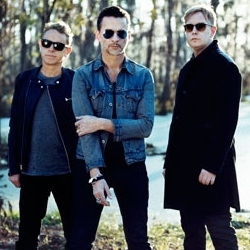 Basildon’s finest, the mighty Depeche Mode, are coming to Glasgow for one night at the new Hydro Arena in November 2013. Following the release of their acclaimed new album ‘Delta Machine’, Depeche Mode have been touring and have just added 5 Winter UK dates, including Glasgow. Confirming their status as the band that redefined the sound of modern music, Depeche Mode are, without doubt, one of the best and biggest bands to come out of the UK. Formed in 1980, in Basildon, Essex, this electronic group’s original line-up consisted of Dave Gahan (lead vocals), Martin Gore (keyboards, guitar, vocals, chief songwriter after 1981), Andrew Fletcher (keyboards) and Vince Clarke (keyboards, chief songwriter 1980–81). Vince Clarke left the band after the release of their 1981 debut album, and was replaced by Alan Wilder (keyboards, drums, production) with Gore taking over songwriting. Alan Wilder left the band in 1995 and since then Gahan, Gore, and Fletcher have continued as a trio. Since their conception in 1980, the band’s infectious brand of electro pop and a series of incredible albums (including ‘Black Celebration’, Music for the Masses’ and ‘Violator’) have seen the band’s popularity continue throughout their lengthy career. So much so, that Depeche Mode are one of the most successful, influential, longest-lived bands that have emerged from the early 1980s. Depeche Mode have had over forty-five songs in the UK Singles Chart and no.1 albums in UK, US and throughout Europe. The band have sold over 75 million albums worldwide, as part of total worldwide record sales (including singles) in excess of 100 million. Don’t miss your chance to see them perform live in Glasgow.